(Phys.org) —Virtual reality experiences through the lenses and screens of future smart devices will keep on coming at us. Now a team of researchers from Vienna and the U.S. believe they have a stepped-up technology to support the intensive virtual environment apps of the future. VR designers will be interested in their paper, "Flexible Spaces: Dynamic Layout Generation for Infinite Walking in Virtual Environments," which deals with their idea of walking in the virtual world. 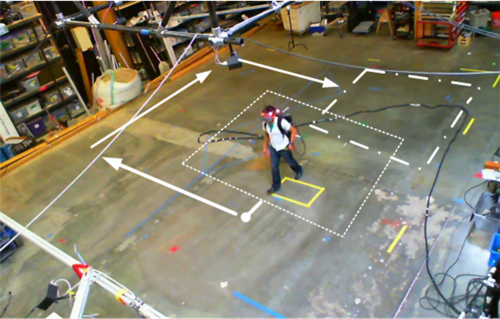 Rather than placing the user in a virtual layout that remains constant, the researchers set a goal toward more flexible spaces–described as infinite real walking in virtual environments. Rather than being hurtled through an endless maze that can frazzle the user's nerves, however, the maze is navigable. When the wearer moves forward, the VR system's computer provides new hallways and rooms. The corridors and rooms are generated automatically as the walker moves to always fit inside the real space available. Their technique involves "procedural layout generation." Designers benefit in that they will be able to focus on content of the virtual world they have in mind, "independent of the implementation details imposed by real walking." 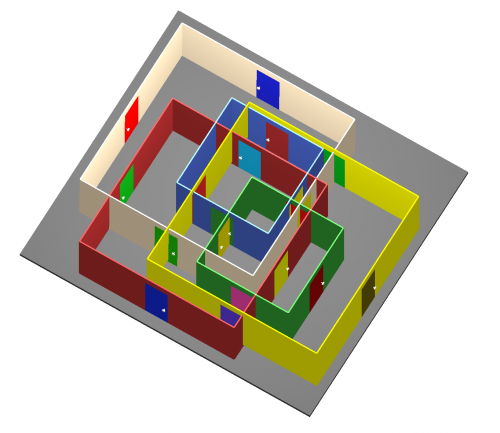 This can make spatial manipulation techniques more practical for use in a variety of application domains. How does it work? Basically, their system tracks the head and body movements of a person wearing a special headset, then steers them through an infinite set of virtual spaces when, in effect, they're just walking around in a circle. For testing, the researchers used a head-mounted display with 150° horizontal and 88° vertical field-of-view. They used a PhaseSpace Impulse Motion Capture System with 52 high-resolution cameras mounted throughout a 9.14m x 9.14m area. Seven active LED markers attached to the display allowed capture of the participant's head movements. They said that the test environment ran on a dual Intel Core i7 2.93 GHz PC running Windows 7, 6Gb of RAM, and a NVIDIA GTX 570 graphics card. The system was presented at the IEEE Virtual Reality conference in March. Applications in mind include virtual museum visits, virtual sightseeing, and explorations of any other kinds of walks through larger virtual worlds. 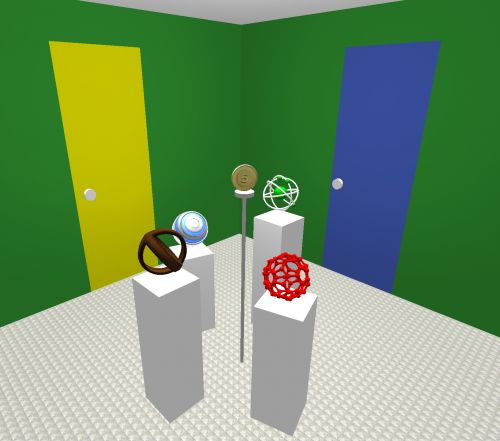 The paper's authors said that "This method is especially useful for VEs [virtual environments] where the content and experience of the environment is more important than the specific spatial layout, such as virtual museums, cybertherapy, entertainment, virtual sightseeing, exploration of fictional environments, and many more." It is Not the Software! What is Seriously missing is a Ballooning SmartPad! Why? You do Not want to missing the Pleasure of a Full, Wide Screen just for the comfort of holding it in the hand. The whole Physical Pad should Balloon up as a 24" screen at the flip of a switch! You can always safely carry a flexible SmartPad on your back. Need never be anymore in a Pocket/Purse. We do not wear our shirts in a pocket...on our backs. and regarding This Video showing the headgear still tethered to a Cable is very Primitive indeed in these Wireless days....even for an experimental system....seeing that sweeping the floor around is disgusting. Wow, that was a rant. And yes it is the software. Otherwise you would just be walking in circles in 3D space. The software is dynamically updating the scene to make it look like you are not walking in circles, when you actually are. All software. The rest is pretty much old hat. I think he might be from the future and just hit his head on the way back. I wonder how small a space you can get away with and still convince the wearer there are no boundaries? This demonstration was in a 9x9 meter square. I've read elsewhere that with a 23 meter radius circle, a user can be convinced that they are walking in a straight line while walking around the perimeter of the circle. Difficult to fit a room that size in most houses, but if you had flat land then maybe you could set up a little outdoor arena. Otherwise it's time for arcades to make a comeback. Put the wearer of the VR system into the interior of a large sphere, which are rolled from the outside with x-y coordinating motors that works with a mean of tracking and predicting the direction and the speed of the walker's next movements. Hydraulic jacks will elevate or lower the whole setup with the speed correspondingly to "climb" or short "jump down". With a large enough sphere, he will be fooled in perceiving running in a straight line forever, or almost anything else, except stumbling over rocky terrains, running into a brick wall (extensible, "pixelated" elements for the whole interior of the sphere?) or falling of a cliff (well, this one may require the whole sphere to be levitated and manipulated by magnetic suspension, with the free drop of at least 50 feet!). Sounds like a patent is in order. I am poor as a church mouse. Can't afford the time and money. Well I'll just save my posts here as proof and badger whoever implement it...for a free system or a paid consultant he he since i thought of it first. Anyway, the idea is limited by that only one user is able to experience it realistically. Will be great for fanatical gamers, I guess. Another idea: Have a series of such systems networked, and the movements information of fellows in the spheres are blended into the VR environmental representations of all, for a simulation of group activity (limitation: no real physical contact, visual and audio interaction only)...NOw the really big idea: 350 ft plus in diameter complexes in space, where the spheres and their systems are spun at different speeds to simulate different gravity strengths, from zero to whatever the users can stand...Good for training astronauts on simulated Mars or wherever, or soldiers to fight future aliens perhaps? he he this is doable now, i think, while we are waiting for the true holodeck! I like the sphere idea a lot, others have talked about omni-directional treadmills as well. I would like full freedom in my range of motion though. If I'm playing a shooter or fighting game, I want to be able to dive and roll on the ground. Jump, take cover, sprint and cut back in another direction. I don't see a sphere or treadmill being remotely affordable that could handle all of that, at least in the near future. Sports games should be great in VR too. Baseball seems like it would be the easiest to pull off (other than golf/racing/hunting/fishing type sports) since it's basically a 1-on-1 game with no contact. I can imagine some form of basketball working too. Football, soccer, and especially hockey seem like they will take much longer. Too big of fields, too much contact, and I can't imagine skating without huge advances.